Prime Minister Narendra Modi will hold talks with Crown Prince of Abu Dhabi, Sheikh Mohammed bin Zayed Al Nahyan, who is also the Deputy Supreme Commander of the UAE Armed Forces, today. Prime Minister Modi is expected to discuss investment opportunities, security concerns and the issue of repatriation of criminals during the meeting. He will also hold talks with Vice-President and Prime Minister of the UAE, and Ruler of Dubai, Sheikh Mohammed bin Rashid Al Maktoum. Prime Minister Modi arrived at the Abu Dhabi Presidential Airport yesterday for his maiden official visit to the gulf nation. Upon his arrival, he was received by His Highness Sheikh Mohamed bin Zayed Al Nahyan. The Prime Minister also interacted with the Indian workers at the ICAD Residential City yesterday. The Prime Minister will address the Indian diaspora at the Dubai cricket stadium later today. Close to 32, 000 people are expected to attend the event. 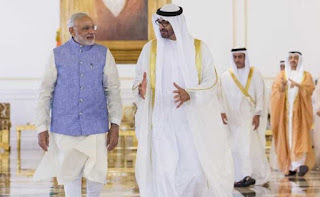 Prime Minister Narendra Modi on Monday visited the Masdar planned city project in Abu Dhabi. Masdar planned city is an eco-friendly zone, which relies on solar and other renewable energy sources for its energy requirements. A total of 6,189 candidates from 92 political parties have registered with the election commission to contest the upcoming general elections scheduled for November 8, the poll panel said on Monday. Myanmar's ruling Union Solidarity and Development Party (USDP), led by new chairman U. Htay Oo, has nominated a total of 1,139 candidates nationwide. The election commission has designated a total of 1,179 constituencies across the country for the vote at four levels of the parliament. Preparations are going on in full swing for Prime Minister Narendra Modi's address to the Indian diaspora at the Dubai Cricket Stadium here today. Close to 32,000 people are expected to attend the event. The Prime Minister also interacted with the Indian workers at the ICAD Residential City. He spoke with the Indian migrant labourers and their representatives and discussed issues of their working conditions. Chinese Premier Li Keqiang has visited the victims who were affected in a series of explosions at a chemical warehouse in Tianjin. According to the BBC, the explosions had claimed at least 112 lives and 95 people are still missing. Li met those who had been injured and displaced by the blasts. A senior military officer said that "several hundred" tons of the toxic chemical sodium cyanide had been identified at two locations in the blast zone. An investigation is still under way to ascertain what triggered the disaster.